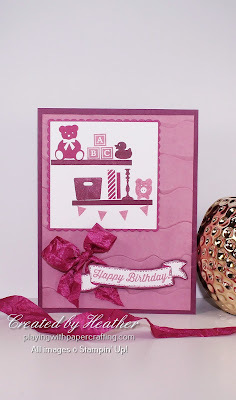 The Bookcase Builder stamp set is so versatile! You can make a child's card, a baby card or a sophisticated adult card all with the same set! 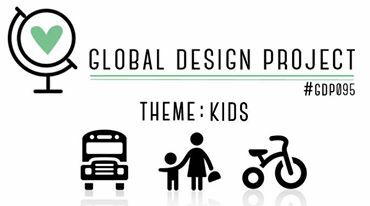 This design works for a toddler best but depending on the colours you use, many of the other images, combined with the teddy bear and piggy bank would work for kids of all ages. The new Ruffled Embossing Folder is AMAZING! but you don't want to be covering up too much of it. Even with the two smaller panels I've used here, you don't get the full effect. On another card I'm going to make it the main event except for a sentiment and a ribbon so you can see the waves and levels it makes. It really looks like layered ruffles! 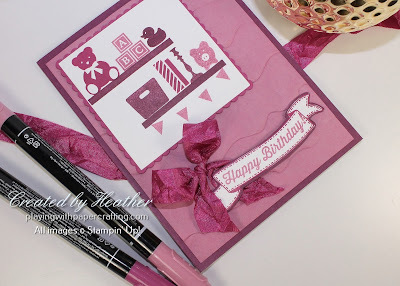 The sentiment is from Birthday Banners stamped in Berry Burst and Sweet Sugarplum and die cut using the Bunches of Banners Framelits. After I die cut the sentiment, I trimmed it further right to the stamped line, using my Paper Snips. Then I die cut another banner shape from Rich Razzleberry cardstock and glued the sentiment on it giving a very narrow border of Rich Razzleberry all around the sentiment for a more finished look. 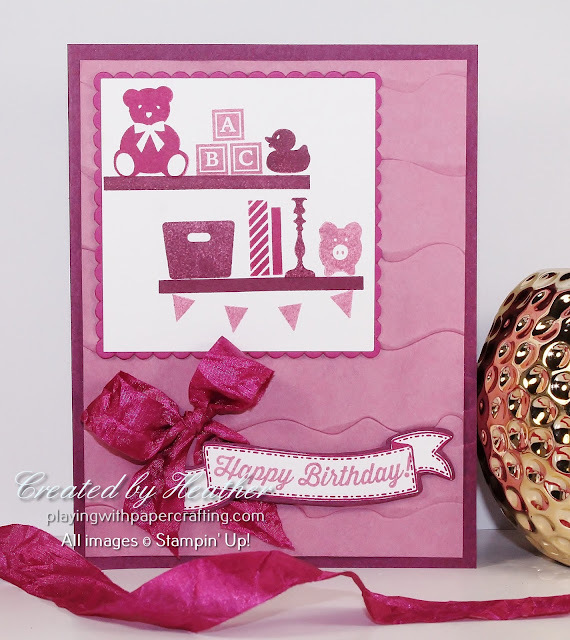 The ribbon is the Crinkled Seam Binding Ribbon in Berry Burst. I just love this ribbon and it makes beautiful bows. I used a few glue dots to position all the parts of the bow just the way I wanted them and then added the sentiment to fit within the bow as you see it here, using Stampin' Dimensionals. 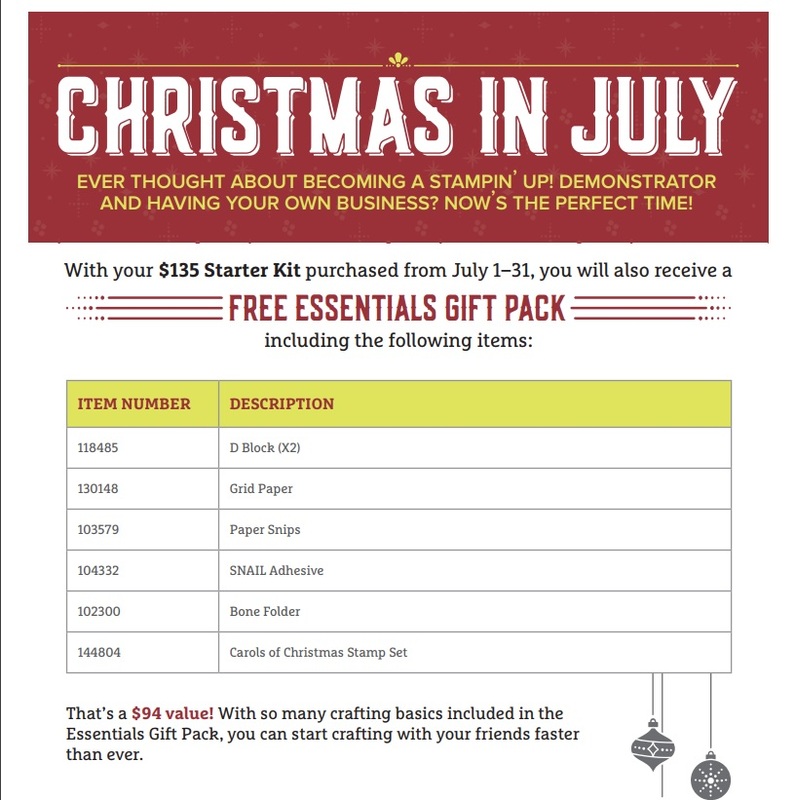 The Carols of Christmas stamp set is one half of an amazing bundle that you will be able to get before it is available to the public August 1st. As a demonstrator, you can also take advantage of 20% discounts on all products minimum, and you will be able to pre-order from and see the new Holiday catalogue a whole month ahead of the public! How can you lose? You don't have to sell if you don't want to, but you need to maintain a 3 month minimum level of sales to remain a demonstrator. No one is going to hassle you if you don't however. If you do decide to make some extra money with the products and the hobby that you love, it is not hard to get started and I am here to help you. To join, click on Join My Team and follow the prompts, or message me for more information.